COBRA® Golf, a leader in golf club innovation, unveiled today its new KING MIM Wedges, the first in golf to feature a fully Metal-Injection-Molded (MIM) 304 stainless steel head construction. The MIM process represents a significant advancement in wedge manufacturing, delivering the most precise shape possible for truly exceptional feel and turf interaction in every wedge COBRA manufactures. Versatile Tour Wedge Grind – This grind, also utilized by Rickie Fowler in his custom ground wedges on Tour, provides additional toe-relief for optimal versatility. You can easily open the face to execute a delicate flop or close the face to hit a bump and run as needed. Precision CNC Milled Face & Grooves – A fully CNC milled face maximizes surface roughness and delivers precise lofts and groove shapes to optimize trajectory and spin performance. Progressive Spin Technology™ – Progressive groove shapes are CNC milled to optimize performance for each wedge loft. The weaker lofts feature wider, shallower grooves, and the stronger lofts feature narrower, deeper grooves to deliver consistent spin from wedge-to-wedge. 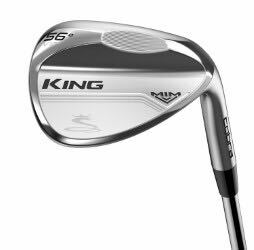 The KING MIM Wedge is offered in 50, 52, 54, 56, 58 and 60 degree lofts, all in Versatile Grind. Each KING MIM wedge features a black Golf Pride Tour Velvet CONNECT grip and an aftermarket KBS Hi-Rev 2.0 (125g) shaft. The KING MIM Wedges will be available April 12, 2019 with a MAP price of $149 per wedge. For more information on the COBRA KING MIM wedges and all of COBRA’s innovative new products for 2019, visit www.cobragolf.com. COBRA PUMA GOLF is a corporate division of PUMA, one of the world’s leading sports brands, designing, developing, selling and marketing footwear, apparel and accessories. COBRA PUMA GOLF is an inclusive company, promoting game enjoyment for golfers of all abilities, attitudes and styles. The brands full-range portfolio includes COBRA Golf’s high-performance drivers, fairways, hybrids, wedges and irons, as well as PUMA Golf’s sport lifestyle inspired footwear, apparel and accessories. Fusing performance and style, COBRA PUMA GOLF brings a focus on innovation, technology, compelling design and superior performance with an edge to the global golf marketplace. For more information, visit cobragolf.com and cobragolf.com/pumagolf.